It's been a really full on couple of weeks as everyone tries to close down the things they need to get done before they go on their Christmas breaks. Personally I've got this week off instead, which is giving me a good chance to recharge my batteries. Our staff trial is underway for the next phase of the Google migrations, with customers having @blueyonder.co.uk e-mail addresses being the next to move over to the Google Apps platform. As we're about to hit the annual change freeze, we'll start moving customers over from early January and all going well we'll be onto moving customers with @ntlworld.com addresses onto Google in no time - but we have a few data cleanse tasks to do first, which are happening in parallel with the blueyonder trial and migrations. The good news is that customers we have already moved over to Google (with @virgin.net e-mail addresses) continue to track well with regards to key measures like faults and customer satisfaction, and we'll be doing some further research to talk to some of these customers (likely early in the new year now) to see what we can learn to make the migration process even smoother for the next customers to be moved to Google. Over the last few weeks I've spent a day with our customer service guys in Manchester, including meeting our wonderful Twitter team for the first time: Pete, Billy, Sam and Gareth are doing great work helping our customers out over at @virginmedia. 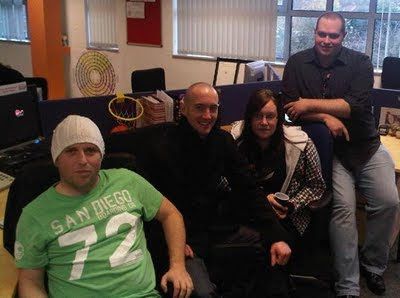 While in Manchester the broadband product reliability team (i.e. the wider cross-functional group working on service improvement initiatives) got a lot of call monitoring done to pick up some nuggets of things to look into and we also held an intensive 2 day workshop with our technical support guys in Liverpool to look at connectivity faults and how we can improve things like toolsets - which is set to keep me out of trouble for the rest of the year and much of the early part of 2010 I expect! There's some detailed analysis going on to look into sample accounts reporting connectivity problems and see what we can do to prevent them happening - although when you consider that something like half of all connectivity problems are down to PCs (software & hardware) it's a bit more of a challenge, but one that we're happy to take on. If I don't get a chance to blog earlier, I'd like to wish compliments of the season to all.